Citizenship is a right often taken for granted by natural-born citizens, but for those who must apply for it, the process can be complicated, time-consuming, and confusing. There are three basic steps on the path to becoming a citizen: gaining legal entry to the U.S., securing permanent resident status (commonly known as getting a “green card”), and applying for naturalization, meaning full citizenship. Step One: Gaining Legal Entry to the U.S.
For those seeking to immigrate into the United States, the first step is obtaining a visa, which grants permission to enter the country and remain here for the time that is required to apply for permanent resident status. The two most common ways to obtain a visa are family sponsorship and sponsorship by an employer. Their unmarried children under 21 years of age. Citizens and lawful permanent residents can sponsor other family members as well, in limited categories, under a complicated set of family-sponsored preference visas. 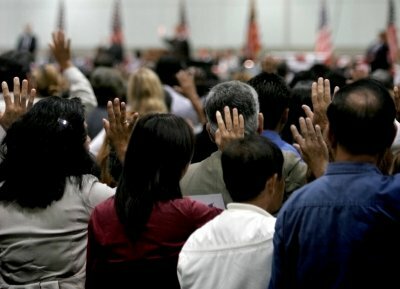 The Immigration and Naturalization Act contains a series of preference allocations and per-country caps that make exact calculations difficult, but generally speaking it allows for 480,000 family-based immigrants each year. Visas may also be issued to immigrants who are sponsored by an employer, allowing them to reside in the United States with the intent of securing permanent legal residence. There are a limited number of annual employment visas available, typically capped at 140,000 each year, divided among five preference categories, each, again, with its own cap. A far less common route to obtaining a visa, but one that has dominated recent news, is for a migrant “who has fled his or her country of origin because of past persecution or a fear of future persecution based upon race, religion, nationality, political opinion, or membership in a particular social group.” People with a well-founded fear of persecution may apply for a visa through refugee or asylum status. People outside the U.S. may apply as a refugee, while refugees who are already in the U.S., or are seeking admission at a port of entry, may apply under the asylum category. Those granted a refugee visa must apply for permanent legal residence after one year, while those with asylum status have the option to apply after one year. The number of people admitted as refugees is determined on an annual basis by the President in consultation with Congress. In fiscal year 2018, the cap was set at 45,000, and 22,491 refugees were resettled in the United States. Gavin Broom, a Scotland-born citizen of the United Kingdom now living in Michigan, obtained his green card in 2015. Broom initially entered the U.S. in 2012 on a work transfer visa, but chose to take a different route to citizenship after he arrived. “I was very lucky,” says Broom. “The company I worked for assigned me an immigration lawyer, and covered the expenses for initiating the green card process.” After marrying his fiancée Helen, a U.S. citizen by birth, he was advised that going the family-sponsored route to securing a green card would be faster and less cumbersome. Both routes required completion of in-person interviews, paperwork, fingerprinting, and an FBI background check. According to New Jersey based immigration lawyer Carolina Curbelo, permanent resident status is not really permanent. It can be revoked if the card holder ever runs afoul of the law and commits a felony. Despite this fact, Curbelo says that in past years many immigrants chose to pause after securing their green card and simply reside in the U.S. as legal residents. After the series of travel bans imposed by the Trump administration, Curbelo began to notice a shift in attitudes. Stories of green card holders – permanent legal residents with jobs and family in the U.S. – being detained at airports and denied re-entry to the U.S. resulted in many long-time legal residents flocking to Curbelo to apply for naturalization. “There’s much more interest in becoming a citizen now,” she says. “I’m seeing applicants who have had their green cards for over 20 years, who are now concerned about their ability to stay here.” The daughter of Cuban refugees herself, Curbelo understands the fear and uncertainty that her clients have about the possibility of having to return to a country that they fled decades ago, while U.S. immigration policies continue to be in flux. Although there are some exceptions to the requirement, most green card holders who are 18 years or older are eligible to apply for citizenship after residing in the U.S. for five years. In addition to fingerprinting and criminal background checks, they must prove their ability to read, write, and speak English. Applicants also must pass a civics test proving they have a basic understanding of U.S. history and government. Broom applied for naturalization in May of 2017, and after completing another round of interviews, scans, and background checks, and then passing the civics test, he has just one more step to go along his journey: taking the oath of citizenship and declaring his allegiance to the United States. At the time of his interview the government shutdown had created a backlog in assigning dates for taking the oath, but he is hopeful that it won’t be long before he is able to complete the final step on his pathway to citizenship. Additional details, including forms, instructions, and other helpful resources can be found on the United States Citizenship and Immigration Services website. This article originally appeared in the February 9, 2019 issue of Wide Angle, our regular newsletter designed, we hope, to inform rather than inflame. Each edition brings you original articles by Common Ground Solutions, a quiz, and a round-up of news items — from across the political spectrum — that we think are worth reading. We make a special effort to cover good work being done to bridge political divides, and to offer constructive information on ways our readers can engage in the political process and make a difference on issues that matter to them.